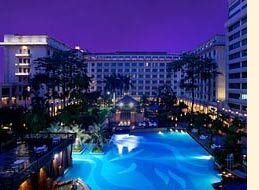 Grand Royal Hotel, one of the chain hotels of the Grand Hotel Management Group, was grandly opened in January of 2006. It is a 5-star deluxe business hotel offering comprehensive hotel service. Its also a designed hotels by China Import and Export Fair (Canton Fair) to have a registration office inside hotel lobby to make buyer entrance badge for our guests, with this privilege your time and trouble to queue up at the trade fair’s gate is avoided. The hotel is conveniently situated in the new town area of Tianhe, the Dongpu District. It is a new prosperous and developing hub of Tianhe, Guangzhou. The hotel features 262 beautifully appointed rooms and suites. It has a Chinese restaurant - Yue King Heen, a modern western restaurant - Royal De Café. The lobby lounge, along with 4000 square meters of meeting and conference space. The Executive Lounge is designed to offer hotel guests a very personal and dedicated level of service. The hotel is at a very convenient transportation conjunction. It is only 3 minutes drive from Canton Fair Pazhou Exhibition Center, and 35 minutes from Guangzhou Baiyun International Airport by taxi. The hotel can be easily reached from Hong Kong by shuttle bus or boat. The Grand Royal Hotel offers our guests an elegant, refined world of European class. So be our royal guests! Enjoying good reputation for affluent cultural background and excellent service, The Garden Hotel, Guangzhou sets another milestone by winning the prestigious Platinum Five-Star Award issued by the China National Tourism Administration. Our hotel is one of the three hotels in China and the only national brand hotel in South China to receive this significant award, which is the highest hospitality award in China. A luxury hotel in the city centre of Guangzhou in the People's Republic of China, The Garden Hotel Guangzhou is centrally located on Huanshi Dong Lu, in the heart of Guangzhou's prosperous business district, only 35 kilometres from Guangzhou Airport. The hotel is less than 15 minutes away from the Trade Fair Centre, and within easy reach of many attractions of Guangzhou such as Shamian Island and the colourful Qingping Market, as well as some of the city's best shopping, dining and entertainment. The Garden Hotel Guangzhou features 828 rooms and suites, all comfortably furnished and offering a wide range of amenities. And whatever cuisine takes your fancy, you'll be able to find it at The Garden Hotel. The hotel offers a wide range of dining options, with different restaurants and bars, including the Carousel Buffet Restaurant on the 30th floor of the hotel tower, the Furusato Japanese Restaurant and the Peach Blossom Chinese Restaurant. The most exclusive dining establishment at The Garden Hotel, however, is the elegant Connoisseur Restaurant, which offers the finest French and continental cuisine. For business guests, The Garden Hotel Guangzhou offers distinctive services and facilities such as 24-hour butler service, 24-hour gym as well as free in-room broadband internet. The Garden Hotel is an ideal venue for meetings and banquets featuring ten highly versatile function rooms and a grand Garden Ballroom, all of which boast state-of-the-art audio-visual facilities. The hotel also features a well-equipped Business Centre, a tranquil back garden, exceptional recreational facilities including an outdoor swimming pool, tennis and squash courts, and a relaxing spa. Honored with the International Five Star Diamond Award by the American Academy of Hospitality Sciences from 2006 to 2008, Dong Fang Hotel has shown its high standard quality of services as well as its global presence. For the past 40 years, there’ve been numerous global leaders and celebrities paid their visits here, including Chen XiangMei (Anna Chennault) – the widow of World War II aviation hero Claire Lee Chennault, Margaret Thatcher - the former Prime Minister of the United Kingdom, Juan Antonio Samaranch - the former President of International Olympic Committee, and Valéry Giscard d'Estaing – the former President of France, etc. 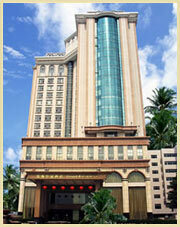 Nowadays, it’s still one of the most popular business hotel in Guangzhou. Featuring 699 luxury guestrooms, the most recent renovation in 2006 has provided guests a complete list of accommodation choices. From deluxe/superior business rooms to CEO/executive suites, Dong Fang Hotel provides you the state-of-art room amenities as well as nothing-but-luxury facilities to easy your busy mind. The 1-acreage central garden is your home of relaxation. The open-air pool, sauna, squash room, tennis, and gym will enrich your every stay at Dong Fang. The Hotel is also equipped with 5 restaurants and 1 lobby bar. Guests are offered both Chinese cuisines and Western delicacies. A couple of other featuers include a reading room, offering classic novels, magazines and newspapers for you to spend your quiet afternoon, and a karaoke room great for small parties. 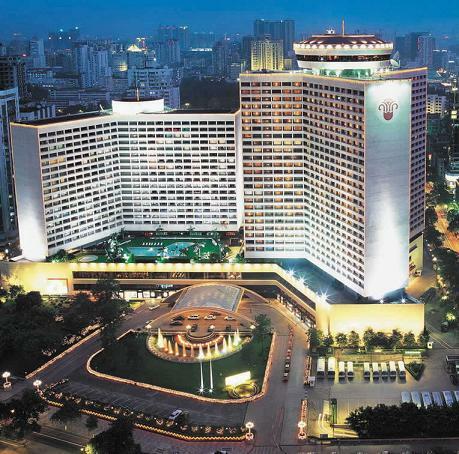 The convention and exhibition facilities at Dong Fang have also earned its reputation as the business hotel leader in Guangzhou. They consist of 20 function rooms, a Golden Hall, and a leisure green hallway. The function rooms may serve small group executive meetings as well as various conferences and business gatherings. The most feature of the Golden Hall is its over 3000-square-meter space without columns and may accommodate meetings of up to 2000 participants as well as performance arts and wedding banquets of the same scale. The leisure green hallway provides an extra casual gathering space for meeting guests. With a few clicks through online hotel reservation, you can reserve accommodations at Dong Fang Hotel for your business hotel in Guangzhou.